In Part I of this article, which appeared in the July 2013 issue of Skin Inc. magazine, the different types of rosacea were described and explained, and tips were provided to help skin care professionals identify rosacea versus acne, dermatitis and facial dandruff. Part II will discuss how to design a skin care program for clients with rosacea, as well as how to work with these specialized clients. The first and most important step is to decide if clients are suffering from the exquisitely sensitive skin of the erythematotelangiectatic type of rosacea, or the tougher skin of papulopustular rosacea—or if they fall somewhere in between. In general, the facial skin barrier strength in rosacea is abnormal, making any irritating products or treatments—such as those for anti-aging or acne—much more aggravating to rosacea-prone skin. What’s the best way to begin working with clients who you believe might have rosacea? Ask what products and procedures they have used before. What have they tolerated or not tolerated? Use this history as a guide. When in doubt, start cautiously by using nonirritating products. Following are the basic skin care steps that you can use to create a complete skin care routine for your rosacea clients. Use gentle, nonirritating products, and minimize scrubbing or exfoliation at first. Avoid foaming cleansers, except for only the most oily papulopustular rosacea. Synthetic detergent cleansers, such as Cetaphil*, are excellent to use. In addition, a medicated cleanser, such as a soap with 2% pyrithione zinc or a prescription sodium sulfacetamide/sulfur cleanser (a sulfa antibiotic and sulfur combination), should often be used once a day as a great way to deliver treating ingredients. Alternate this medicated cleanser with a nonirritating synthetic detergent cleanser, because some of these products can be drying. For excessive facial scales and engorged or clogged pores, you can very gently try using a facial sponge or automated skin-cleansing brush on a gentle setting with a delicate brush only. 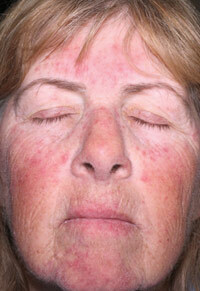 However, the skin may not tolerate this, so only try it when rosacea is in remission. Generally avoid facial toners for all but the most oily rosacea complexions. If you do use them, stick to alcohol-free, gentle products only. Use high-concentration green tea antioxidant and caffeine combination products. This should be considered part of treatment because studies have shown that clients with rosacea have skin that is antioxidant-depleted, so it is important to use products that contain extremely high levels of soothing green tea antioxidants. When combined with caffeine, they are even more anti-inflammatory. Avoid vitamin C as an antioxidant because it is too acidic for most rosacea-prone skin. Facial dandruff often occurs with rosacea and needs to be treated, too. A soap with 2% pyrithione zinc, and green tea antioxidant and caffeine products together may be sufficient treatment. If not, clotrimazole cream can be used twice a day until it’s under control. There are prescription U.S. Food and Drug Administration (FDA)-approved and “off label” skin care treatments that dermatologists use. These need to be worked into the skin care routine by the treating physician. Typically, clients should be asked to apply medicated treatments after the green tea antixoidant and caffeine products, but before their moisturizers or sunscreens. Some of the FDA-approved products include metronidazole cream or gel, sodium sulfacetamide, sulfur cleansers and azelaic acid. Moisturizers are important to heal the compromised skin barrier. Choose only nonirritating moisturizers, meaning no alpha hydroxy acids (AHAs), beta hydroxy acids (BHAs) or vitamin C. Pick your moisturizer based on skin type, selecting heavier, richer, oil-containing products for drier skin. People with oily papulopustular rosacea may not want to use a moisturizer. Non-oil hydrating ingredients, such as hyaluronic acid and glycerin, may help increase skin moisture without leaving a heavy product feel on clients’ skin. Sun may play a role in rosacea, especially the erythematotelangiectatic type, which means that daily sun protection is important. For people with rosacea, physical sunscreen ingredients—such as zinc oxide or titanium dioxide—are preferred to chemical ingredients. Chemical sunscreens can sting and irritate sensitive rosacea skin, and they also generate a slight amount of heat as they deflect UV rays. Five percent or higher zinc oxide products are recommended. Mineral makeup can provide additional sun protection when applied on top of sunscreen. Mineral makeup powder is tolerated best due to its simple ingredients. *Cetaphil is a trade name of Galderma Laboratories, Fort Worth, TX. Rosacea-prone skin is sensitive and has weakened barrier strength, meaning it’s easy to irritate with facial acid peels, massage or mechanical stimulation, such as microdermabrasion, as well as many of the products used to target acne or anti-aging concerns. Following are general guidelines to adhere to for rosacea-prone clients. Anti-aging treatments. Anti-aging skin treatments are tricky because they can irritate rosacea. 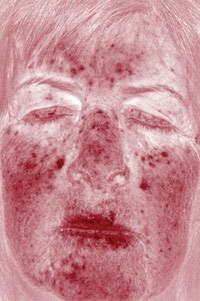 It’s best to avoid chemical peels on rosacea-prone skin and, instead, use very cautious microdermabrasion treatments. This is because skin barrier function in rosacea is altered, and chemical peel predictability depends on absorption of the peeling agent. Microdermabrasion, on the other hand, is a purely physical exfoliation of the skin. 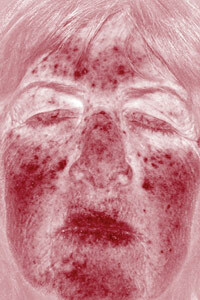 However, the mechanical stimulation can aggravate rosacea. To help counter this, follow a microdermabrasion treatment with a Calming Facial. Another great anti-aging treatment for rosacea clients is intense pulsed light (IPL), because it offers anti-aging and anti-rosacea benefits. Incorporating anti-aging products into a rosacea client’s skin care routine needs to be done cautiously because most effective products can be irritating to sensitive skin. Only introduce anti-aging products when rosacea is in remission and the skin barrier has had a chance to heal for at least a few months. One of the most well-tolerated anti-aging product for rosacea-prone skin is tretinoin. In fact, some dermatologists use tretinoin to treat rosacea. The acid pH of many of the powerful anti-aging skin care products, such as professional vitamin C and AHA products, makes them poorly tolerated, especially for erythematotelangiectatic rosacea. Papulopustular clients may, however, do surprisingly well with acid pH anti-aging products once their rosacea is controlled. Encourage your clients to avoid trigger factors that exacerbate their rosacea or cause flushing, such as temperature extremes, spicy foods, alcohol and harsh climates. Very gentle facial massage can be helpful. In fact, one study showed that gentle central facial massage done daily can help rosacea. 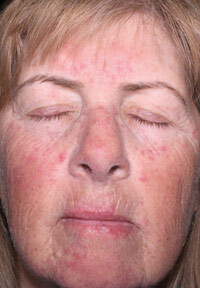 Also, the treatment and control of rosacea helps prevent permanent telangiectasias and skin damage. When you have a client who is not getting better, ask them to bring in all of their products and check for problem ingredients, such as cortisone, or irritating ingredients, such as vitamin C, AHAs and BHAs. Remember, when you have a client with severe skin inflammation, refer them to a dermatologist to help prevent scarring or hyperpigmentation. A physician can provide a prescription oral antibiotic, which often works quickly to jump-start control so that a good anti-rosacea skin care routine can finally take hold. Cynthia Bailey, MD, is a board-certified dermatologist practicing general, surgical and cosmetic dermatology in Northern California since 1991. She is the director of Advanced Skin Care and Dermatology Physicians, Inc, and founder of DrBaileySkinCare.com. Bailey is first and foremost a clinician with a pragmatic approach to care and a heavy emphasis on skin health education. Her practical skin care information and advice can be found throughout the Web and in numerous international print publications. In this series of photos using a facial imaging system, it is evident that this client has both erythematotelangiectatic rosacea and a papulopustular flare. Notice the degree of skin inflammation and redness before and after the facial. Following the treatment, the skin shows less intense redness both in the normal lighting photo and in the exposure designed to detect redness. Also, notice how well her skin tolerated the facial in spite of the fact that it was very reactive in the midst of a rosacea flare up.